Scouting is an exciting activity for many outdoor hunters and adventurers. For them, finding the right trail camera is as exciting as a child waiting to open her birthday gifts. With a trail camera, you are able to capture photos of different kinds of wildlife. You are also able to discover different behaviors and activities of animals that you do not normally see when there are people around. Aside from observing the wildlife, a trail camera also lets you monitor your surroundings. You can see what animals thrive in your area and where they usually go. You will even be able to catch a trespasser with this. The Game Spy has a 10 MP camera resolution that is sure to give high quality images. It also has a no glow feature that makes scouting a lot easier. With this technology along with a Mossy Oak Camouflage design, this camera is pretty much undetectable and will not scare away animals that are around the area. This will help you obtain accurate details without sacrificing the quality of the images. Plus, you can get this camera for an affordable price. This feature helps the camera take quality night time photos with less blur. This camera also offers a 70-feet night range. With this, you can be sure not to miss any details at night. In addition to these features, this camera has different modes that you can program. These are the time-lapse plot camera, an infrared-triggered plot game camera, day and night HD 720p video, and plot camera by day and motion detect at night. This camera has a built-in screen display that allows you to clearly see the photos and videos on-site. Pieces of information such as barometric pressure, temperature, moon phase, date, time, and camera ID stamp are also shown. You can also delete photos through the LCD screen. If you want to get closer to a subject, you can make use of this camera’s 3x zoom function. You can also opt for the FastFire Continuous Shooting technology that will let the camera shoot up to four images per second. With this, you are sure that you will not miss any movement of a subject. It can accommodate up to 8 AA batteries and a 32 GB SD card. One unique feature of the Game Spy camera is its password protection. Now, you need not worry about your photos and videos being access by anyone else other than yourself. This camera is efficiently wrapped in a sturdy case. This makes the camera extra durable which assures you that this will certainly last longer. The casing also keeps the camera safe from possible water damage, making it safe from any weather condition. This camera has a long battery life. Whether on standard or on a battery-saving mode, this camera still takes quality photos. It is also easy to change batteries and you can even choose to use rechargeable ones to save on expenses. Trail cameras are useful tools to help you in your hunting activities. You no longer have to keep on waiting in the area to observe animal activity patterns and determine where the animals gather and when they are usually out. Now, you can just set up the camera in a suitable location and it will be the one to gather the necessary details for you. 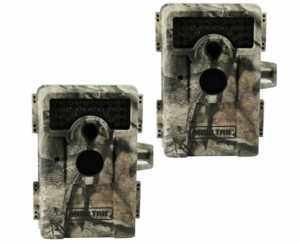 The 2-Piece Moultrie Game Spy camera is surely the perfect trail camera for your hunting and scouting adventures.